We loved our stay! The location was perfect, great position to the beach/pier. Walking distance to cafe’s and eating places. The resort exceeded our expectations, the room itself was lovely and spacious, everyone was very friendly and accommodating to us. We had a 2bdrm ocean view, really nice room, well kept and spacious, great view overlooking the pool and out to the bay, great staff, and the food was excellent, highly recommend the brisket, its not cooked with smoke, but it was tender and juicy with a killer sauce. Next time we want to try one of the penthouses. The setting, the room was excellent, we were upgraded, the pool,secure parking and helpful staff, large balcony. The apartment was set up beautiful and the staff were wonderful and helpful. I will be staying here again. Lock in a great price for Oaks Resort & Spa Hervey Bay - rated 9 by recent guests. 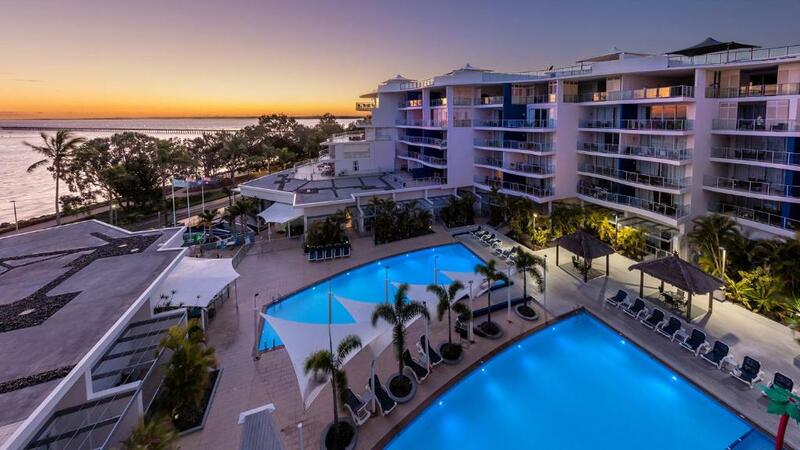 One of our top picks in Hervey Bay.Oaks Resort & Spa Hervey Bay offers apartment style accommodation opposite the Urangan Beach Pier. Located on the waterfront, it features 2 lagoon pools and a restaurant. Guests enjoy free WiFi and unlimited access to a variety of free in-room movies. 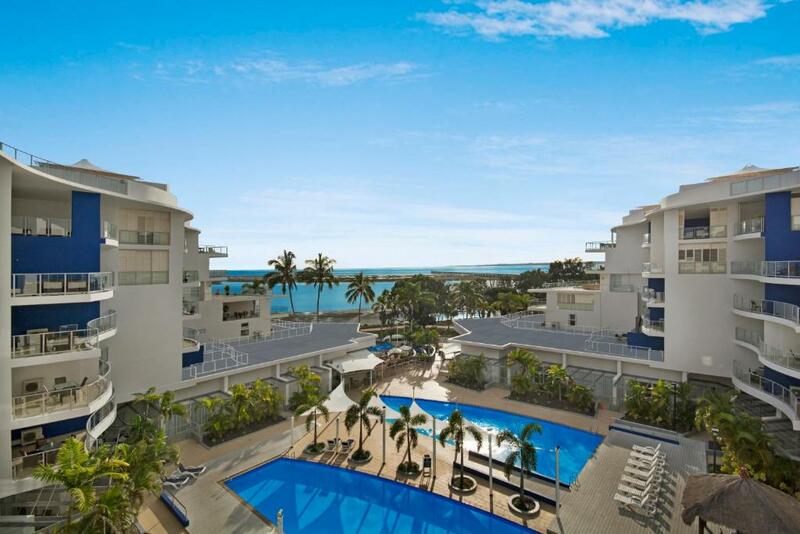 Oaks Resort & Spa Hervey Bay offers self-contained 1, 2 and 3-bedroom suites, all featuring a spa bath. All guests have unlimited access to a large variety of new release in-room movies. 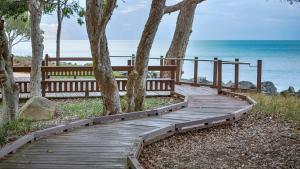 Most apartments also offer views over Hervey Bay and Fraser Island. Leisure facilities include a day spa and a fitness centre. The tour desk can arrange activities such as whale watching, swimming, boat tours and fishing. Guests can enjoy a relaxed meal or drinks at Bayswater Bistro & Bar which offers views over the beach and pier. Salt Cafe serves modern Australian cuisine at breakfast and lunch. Oaks Resort & Spa Hervey Bay is located only 10 minutes’ drive from the Fraser Coast Airport and 2 hours' drive from the Sunshine Coast. Urangan is a great choice for travellers interested in whale watching, fishing and scenery. This is our guests' favourite part of Hervey Bay, according to independent reviews. 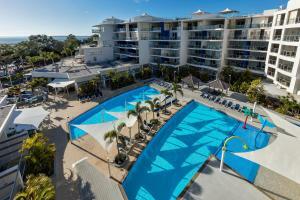 Oaks Resort & Spa Hervey Bay has been welcoming Booking.com guests since 31 Aug 2010. 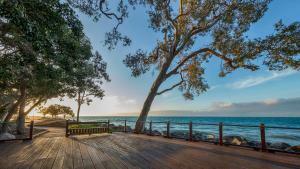 When would you like to stay at Oaks Resort & Spa Hervey Bay? This apartment features 2 spacious bedrooms and bathrooms, a full kitchen, a laundry, and an open-plan living and dining area. 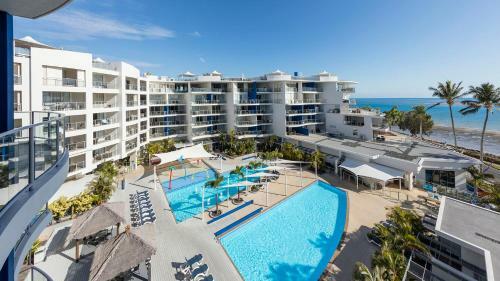 It offers a large private balcony and a roof top terrace with a spa bath and expansive views of the Bay and Islands. This apartment features 3 spacious bedrooms and bathrooms, a full kitchen, a laundry, and an open-plan living and dining area. It offers a large private balcony and a roof top terrace with a spa bath and expansive views of the Bay and Islands. This apartment features a balcony, dining area and soundproofing. This apartment features a balcony, seating area and flat-screen TV. This apartment has a balcony, seating area and oven. This apartment features a balcony, dining area and tile/marble floor. This apartment features a balcony, soundproofing and satellite TV. This apartment has a balcony, stovetop and toaster. This apartment features a balcony, iPod dock and toaster. Oaks Resort & Spa Hervey Bay is located on Hervey Bay’s picturesque Esplanade, just a pebble’s throw to renowned, family friendly beaches, the resort offers every guest an unforgettable stay for all the right reasons. Whether you’re seeking a romantic getaway, family adventure or private retreat, our Resort can cater to you. Our one, two and three bedroom suites have it all - spacious lounge and dining areas, a fully equipped kitchen, separate laundry and a balcony or private patio. 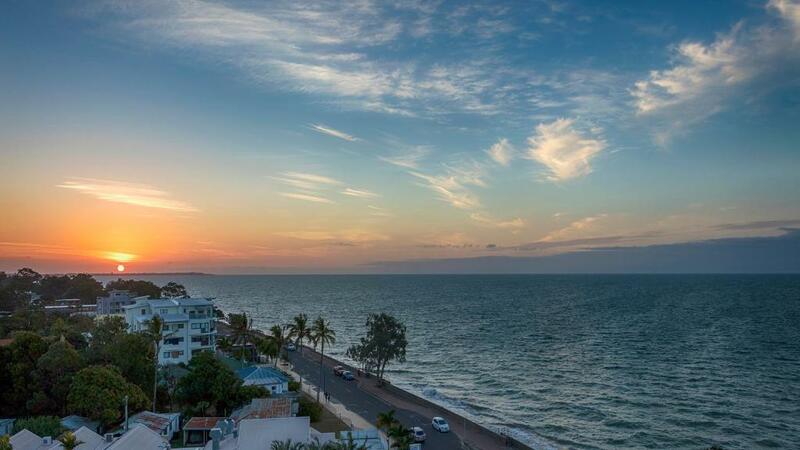 Located on the waterfront in the heart of Hervey Bay, the Resort is an easy stroll to boutiques, restaurants, bars, tours and local attractions. Located on the waterfront, it features 2 lagoon pools and a restaurant. Guests enjoy free Wi-Fi and unlimited access to a variety of free in-room movies. 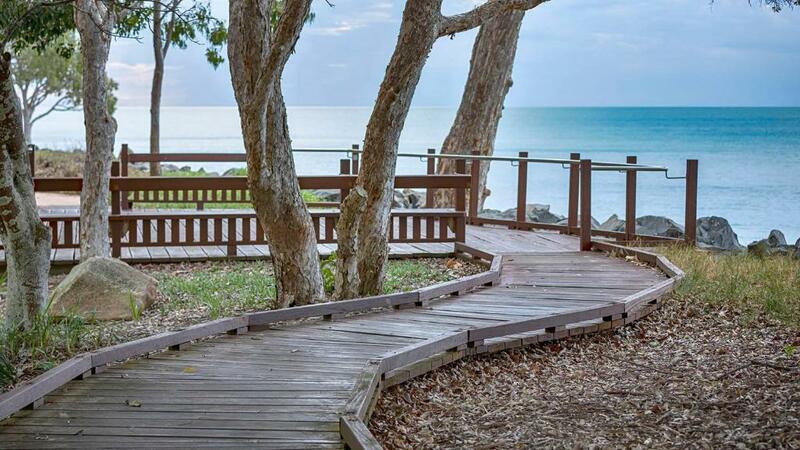 Overlooking the famous Urangan Pier, within walking distance of restaurants and cafes, Oaks Resort and Spa is the perfect location for your stay in Hervey Bay. A short 10 minute walk to the marina, 5 minute commute to the airport and 20 minute journey to the Fraser Island Barge. Property surroundings – This neighbourhood is a great choice for travellers interested in whale watching, fishing and scenery – Check location Excellent location - show map Guests loved walking around the neighbourhood! House rules Oaks Resort & Spa Hervey Bay takes special requests - add in the next step! A damage deposit of AUD1 is required upon arrival, which is about GBP0.55. This deposit is fully refundable 14 days after check-out as long as there has been no damage to the property. Oaks Resort &amp; Spa Hervey Bay accepts these cards and reserves the right to temporarily hold an amount prior to arrival. Oaks Resort & Spa Hervey Bay accepts these cards and reserves the right to temporarily hold an amount prior to arrival. Please note that there is a non-refundable 1.5% charge when you pay with a credit or debit card. Please note that all guests under the age of 18 must be accompanied by a parent/guardian. The property has the right to refuse any booking when the legal guardian over 18 cannot provide a current photo ID or proof of guardianship, if requested upon check-in. Please inform Oaks Resort & Spa Hervey Bay in advance of your expected arrival time. You can use the Special Requests box when booking, or contact the property directly with the contact details provided in your confirmation. A damage deposit of AUD 1 is required on arrival. That's about 0.55GBP. This will be collected by credit card. You should be reimbursed within 14 days of check-out. Your deposit will be refunded in full via credit card, subject to an inspection of the property. The black chunks that came out of the spa when we turned it on. The lounge suite not comfortable. I picked the hotel for its free internet access, but the internet was down on the day of my arrival and could not be fixed. What put me off was that the staff showed no intention of informing me until I ased them about how to access the internet. The lack of initiative in informing the customer was disappointing. The cleaniness of the room was not too bad, but there are a few visible stains on the bedsheet, and the bath tubs had some dirts in it as well. Initial difficulty finding reception from esplanade.